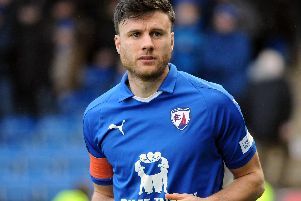 Spireites’ home win over struggling Crawley Town has put them in possession of a much sought after play-off spot. Paul Cook will now be doing everything in his power to maintain it. With three of the next four games being at the Proact, the manager will be looking to consolidate that position and create some sort of gap from the large posse of teams just outside the prized frame. Whilst Crawley took a while to break down, it took over half an hour for Chesterfield to open the scoring, once Eoin Doyle had scored the result was never in doubt. Saturday’s visitors Doncaster Rovers will certainly pose many more problems than Spireites encountered on Tuesday. Paul Dickov’s side are unbeaten in six and unbeaten away from home since mid-October. Cook will be hoping midfield dynamo Sam Morsy recovers from a dead-leg picked up early on in the last game, all of his other players seemed to come through unscathed. The boss will be able to call on the services of new signing Byron Harrison. The 27 year old striker, signed for 18 months from Cheltenham Town, has also played for Stevenage and AFC Wimbledon after coming into league football at the age of 24. Cook insisted that it was an addition to the squad rather than a signing in anticipation of a departure, though his phone is bound to be red hot over the next couple of days. Scouts from 23 clubs were present at the game on Tuesday watching the likes of Morsy, Eoin Doyle, Charlie Raglan and Jimmy Ryan.